“We’ve Had Enough” – An appeal to the fan community to take a stand against slanderous tabloids. Part of my role within Michael’s Dream Foundation is to keep abreast of news related to Michael Jackson. This is something I do on a daily basis; with the aim of sharing interesting articles about him, particularly if they talk about his humanitarian work and his legacy. Unfortunately; part of that territory are the countless tabloid articles I uncover throughout my research all of which I don’t share. In the 27 years of being a Michael Jackson fan; I have never once shared a tabloid article about him and I certainly don’t intend to do so now. Instead; I will echo what Michael himself used to say – I don’t read them. The fact that it’s written doesn’t necessarily make it “truth.” Truth is; I don’t give these articles any more scrutiny than they deserve. Instead, I ignore them and refuse to draw attention to them. Why would I want to give attention to an article that is clearly littered with ridiculous lies about a man I have followed and researched for many, many years? But today; I came across an article I could not ignore. I know only too well that Radar Online take great pleasure in posting negative things about Michael; and are like a dog at a bone when it comes to the subject of the child molestation trial in 2005. The fact that Michael was acquitted of ALL charges by a UNANIMOUS verdict seems to go over their heads. Of course they are going to ignore all the concrete facts in the pursuit of increasing and maintaining their readership. Today however; they went too far.. I shall not continue with the offending article in verbatim. The whole thing is distressing, sickening and anger-inducing to the point where any fan would be able to feel their blood reach boiling point. But as if to add insult to injury; the article then provides a link where you can see this so-called “evidence” for yourself. And why did I find on visiting it? Proof that Radar Online has greatly exaggerated this “evidence” with the aim of slandering Michael and distorting the truth. The pictures depicted on the link are not at all as they are being reported. So why did this particular article bother me more than others I’ve seen? Indeed; only days before did Radar post an article about Michael’s “bizarre sexual behaviour”; allegedly after Bobby Brown claimed he saw Michael slap his sisters’ bottom when he was dating Janet Jackson. Do I see this as “bizarre sexual behaviour”? No I do not. My brother used to do the same to me when we were growing up – and has done it in adulthood. It’s called “sibling ribbing.” Is my own brother therefore a sexual predator simply because he exhibited the exact same behaviour? No he isn’t. But then again; if I was to think along the same lines as the tabloid media – my brother is not an eccentric pop star, desperate to protect his privacy. The real reason for my intense anger at this article was the venom behind it. It is not simply a case of printing ridiculous lies about Michael. This article goes beyond that. It ventures into slander and defamation territory and beyond. I will even go so far as to say that it was less of a news item and more of a personal attack against Michael – and let’s remember that Michael is sadly not here to defend himself. Whoever wrote this article; their hatred and bitterness; to a point of a vendetta against Michael was immediately apparent. Reading between the lines (as I often do when I read any news story about Michael); you could see the toxic poison which dripped from every single typed word. This person knew exactly what they were doing and the timing of such an article speaks volumes. Five days before 25th June? Hardly a coincidence. I do not know who was behind it. That information was omitted from publishing…how convenient. Oh and just for good measure; the article gives a thinly veiled suggestion that more accusations and civil lawsuits should be brought against Michael. “Anything for money” perhaps? Why are these articles now cropping up almost 7 years after Michael left us? Because of the civil lawsuit happening in 2017. And if you think this one was bad; wait for the next one and the one after that. They will get worse especially from a site which is known for being very anti-Michael Jackson. Now it would be so easy to read the offending article, get angry, feel sad for Michael and forget about it. Michael is no longer with us right? Surely it doesn’t matter anymore. WRONG! After reading said article; I took it upon myself to speak to a few fans about it and like me; they are sick, sick, sick of seeing these lies time and time again. And do you know what is more sickening? The fact that the perpetrators of these lies get away with it. Sure; you could contact Radar Online and ask them to retract but it will more than likely be a cold day in hell before they do that. If they are arrogant enough to post this rubbish; they aren’t going to apologize and admit they were out of order. Instead; they’re going to continue posting poison to harm Michael’s reputation, legacy and don’t forget; his children, because they are allowed that “freedom” to do so. How is that right? It isn’t right and it never will be. Seven painful years have passed and even now; the media are still dissecting and mutilating Michael’s good name for profit. If they haven’t stopped after seven years; they aren’t going to stop any time soon. Let’s remember that Michael was and is the most famous person on the planet. His memory will live on for generations to come. And unless we act NOW and do something; so will the defamatory behaviour of the media. Never has it been more important than now to unite and bring the AdLLaw Initiative to fruition. Should that initiative be passed as a law; then Michael’s reputation and legacy can no longer be tarnished by tabloid vultures. And those who attempt to break the law will be held to account for their actions. Wouldn’t it be a wonderful day when tabloids are no longer allowed to defame the names and reputations of those who are deceased and can’t protect themselves? Act NOW and that day can happen a lot sooner. But for it to happen; it takes more than one person to see it through right to the very end. Michael spoke often about unity and the importance of uniting together; in order to make a change. He is quite right. There is strength in numbers. One or two can’t make a difference. But one or two million can. We his fans; are known as his “Soldiers of love.” He referred to us as “his soldiers”. He stood in solidarity with his fans and protected them at all costs. “Don’t hurt my fans,” was his message because he loved us equally as much as we love him. Surely if he can stand shoulder to shoulder with us; then we can afford him that same solidarity? This is a time when he need us the most and the coming civil suit will reinforce that over and over. He begged for his day in court; he had it and he won. Yet that is not enough for some. Hatred against Michael and the fact that he was totally vindicated; is still being fueled by the media and their poisonous articles. Would Michael have stood for it? Hell no! So why are we going to stand for it? The time has come to stand up for Michael and do all we can to protect his reputation. Stoke that fire in your bellies and think about the pictures of Michael during the 2005 trial. Think about that heart-break you went through when you saw that awful sadness in his eyes. Think about that joy you experienced when Michael was cleared. Both Michael and his fans went through all that together. But unless we take a stand against the media; it will have all been for nothing. No other celebrity has been attacked so cruelly by the media; than Michael Jackson. He lived it throughout his life and it made his life a misery. The coverage of the 2005 trial was dubbed “trial by media”. It should have been dubbed “tried, convicted and hanged” by the media and next year; we will see it all over again. It was awful enough the first time. But the difference is; Michael was able to speak out and defend himself from these stories. This time he isn’t. And that’s why it falls to US to do something TOGETHER. There is no “I” in “us”. And you can’t spell “unite” without putting “you” n “I” together. 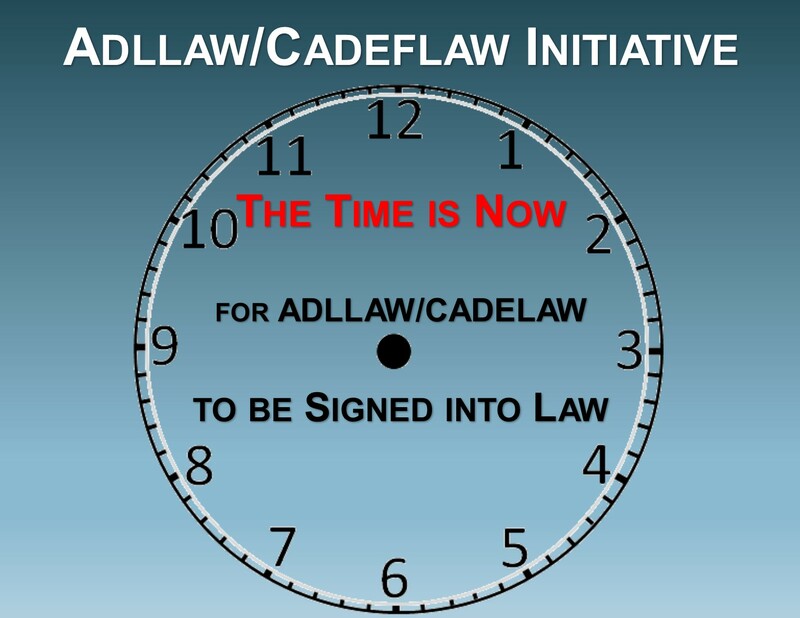 Please support the AdLLaw/Cadeflaw Initiative by adding your name to the global petition and sharing it. 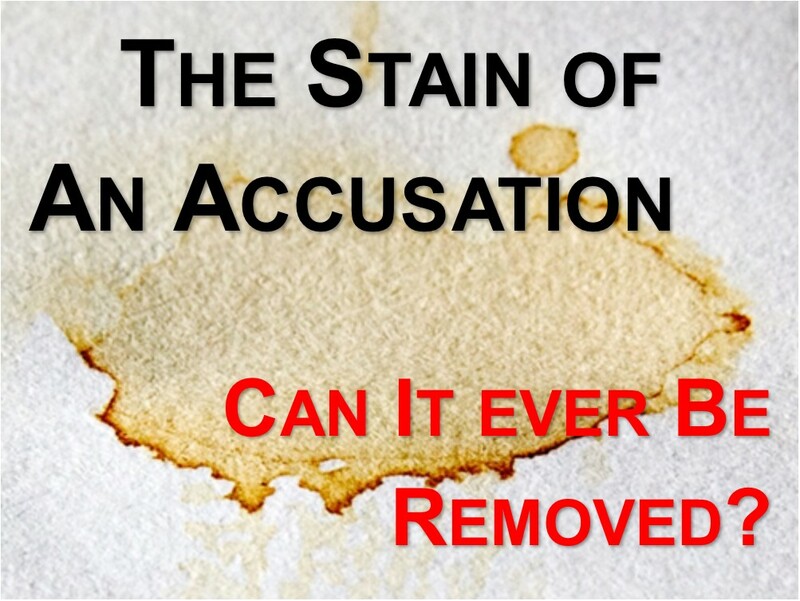 THE STAIN OF AN ACCUSATION: CAN IT EVER BE REMOVED? Can the stain of an accusation ever be removed although the accused may have been exonerated in a court of law? Many people including myself do not think so and I’ll explain why. A rose is still considered a rose regardless of the specific names given to each class of roses. It still looks like a rose. An accusation is a charge of wrongdoing; imputation of guilt or blame. A stain is defined as a cause of reproach; stigma; blemish. Both sounds the same to me. Let’s talk about stains for a minute. It is possible to cover up the appearance of blood stains but is the stain really gone? I found one Reader’s digest article HERE http://www.rd.com/slideshows/how-to-remove-blood-stains/ that gives us “8 Common Items That Remove Blood Stains”. The items include vinegar, ammonia, hydrogen peroxide (work only on fresh blood stains), cola, WD-40, cornstarch, talcum powder and cold salt water. Article also states blood stains are relatively easy to remove before they set but can be nearly impossible to wash out after 24 hours and this is the significant problem with the aftermath of a stain. From this article and perhaps many others we understand that it is possible to remove stains, especially blood, if we act quickly but the problem remains: The stain is still there although we cannot see it and it is possible for the stain to be uncovered via other means or methods. 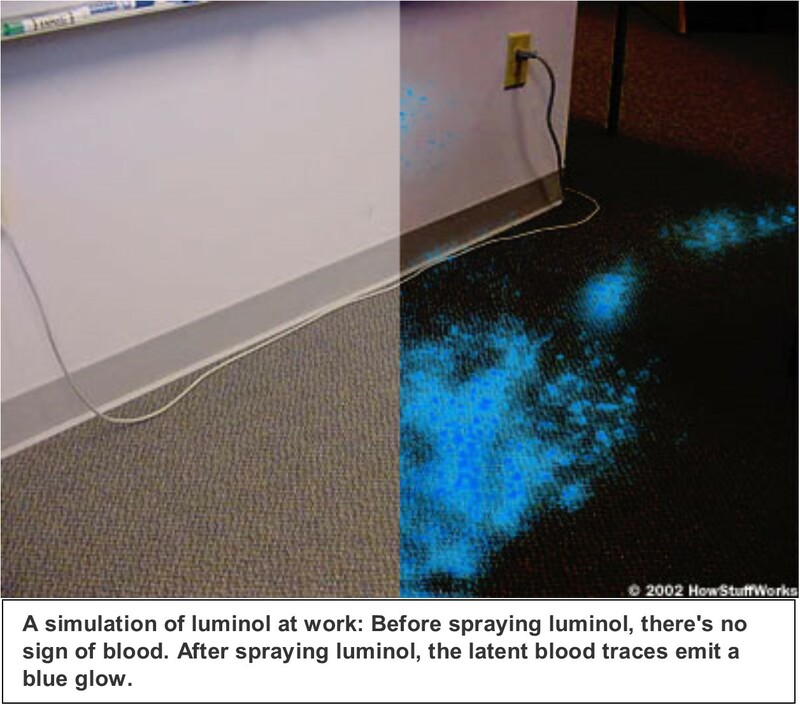 Then we have the chemical “Luminol” used by criminal investigators at violet crime scenes in hopes of discovering blood. Much of crime scene investigation, also called criminalistics, is based on the notion that nothing vanishes without a trace. This is particularly true of violent crime victims. A murderer can dispose of the victim’s body and mop up the pools of blood, but without some heavy-duty cleaning chemicals, some evidence will remain. Tiny particles of blood will cling to most surfaces for years and years, without anyone ever knowing they’re there. So now we consider the ill effect of the “Stain of An Accusation”. Remember Michael Jackson, marked as a child molester, who seems to be a popular topic of conversation among admirers and skeptics. Many of his admirers are of the opinion or belief that if the accusations are ignored they will eventually disappear. I have to strongly disagree with that kind of thinking. Evil and negative thoughts are always present, though the evidence of it may remain dormant for long periods of time they are still there. Like blood stains may well go undetected to the naked eye they still exist. “Never Recovered” is the most significant phrase in the excerpt above. That’s the after effect of the stain I speak of, the stain of a severely injured reputation that can never be repaired or removed. An accusation left unchecked causes the stain to enlarge its territory by way of ravenousness wolves. If the person being accused were living it would be up to them to address their accusers and still that may not halt the public indictments or remove the stain, but the possibility of defending oneself is greater. On the other hand what about the deceased and who will defend them? Who will speak on their behalf? What can we use to remove that stain or to keep it from spreading further? 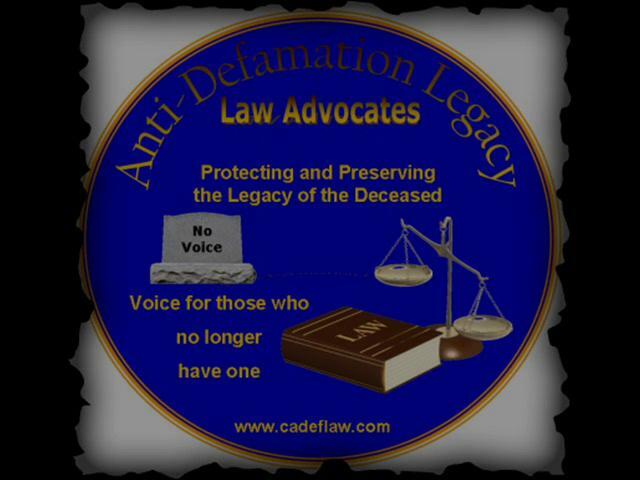 Only the existence of an “Antidefamation Legacy Law” to first, protect and preserve the “Legacy of those Deceased” and second to protect the “Sanity of the family members or those left behind”. Why not bring about legislation which will include the deceased among those who, when defamed, can have the same legal protection as the living; by giving their family members a statute upon which to base a civil cause of action? 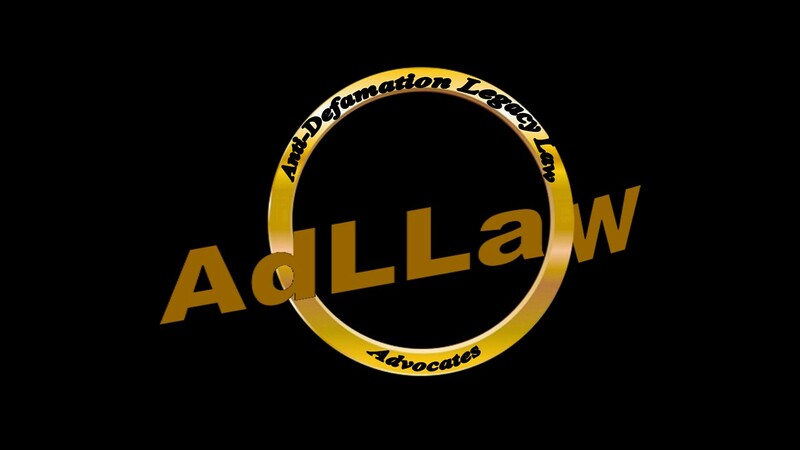 We, The Anti-Defamation Legacy Law Advocates, see this initiative or law as any other; a possible deterrent for most and a tool for the more serious offenders. If a person is deceased nearly anything can be said or written about them. Even the non-famous can be targets which mean that we and our loved ones are at risk. Intentional defamation of a decedent does more than just hurt their survivor’s feelings; it can endanger their health and welfare through false public perception, judgments and actions taken. We hold dear our First Amendment rights, but there is nothing in our Constitution about bearing false witness as a legal right. Try as we have been doing for five years now we cannot do anything about the horrible stain that has been imputed to Michael but we can help his children and family by standing together in favor of this law. “Alone we’re just an “Echo” in the mountains but TOGETHER we are the “Mountains”. Support the AdLLaw Initiative today. More and more the public is calling for the reigning in of intrusive police practices and tabloid news that constantly abuses the right to a free press and infringes on people’s privacy rights. During his lifetime, Michael Jackson endured extraordinary invasions of his privacy as a public figure, as well as slander and defamation of his character, to which he protested vigorously. Nor was it not long after his death on June 25, 2009, that the media started in on his family, especially his underage children. And while there is at least the possibility of legal remedy for the living, heretofore there has been none to protect the rights of the surviving family of the deceased. That is why CADELAW is a bill whose time has come. The case of Lennon, according to Barnes, leads to understanding how an “equally powerful superstar,” Michael Jackson was also considered a monumental threat to disrupting the status quo. Michael’s 1998, “Man in the Mirror” (written by Siedah Garrett with Glen Ballard), along with the revolutionary social and political message in the lyrics and in the images used in the short film that went along with it “put the world on notice,” according to Barnes. Barnes asserts that while trying to prove there was an “actual conspiracy to imprison Jackson” was elusive, the case could be made for Jackson being a convenient scapegoat to deflect heat off the Catholic Church because of the concurrent sexual abuse allegations against clergy of the Archdiocese of Boston. The massive investigation of the Catholic Church went on for several years before Jackson was again falsely accused and his Neverland ranch raided by 70 County Sheriff’s and members of Tom Sneddon’s District Attorney’s Office. All this to control Michael’s rising political influence. From 1994 until he died, Michael endured relentless persecution from the media. Barnes asserts that while the U.S. Constitution grants free speech and freedom of the press, the Supreme Court fails to enforce the laws that require prerequisites to the proper exercise of those freedoms and the protection of constitutional rights. She notes that the media defends slander and defamation by asserting that the statements they make are true for the most part. False statements also get a pass as simply being reported or quoted, most often from anonymous, so-called inside sources. Still, Michael is gone now and supposedly what the media writes or broadcasts can no longer hurt him. Obviously not, but it can and does hurt his young children, as well as other family members who share his name. For that reason, our representatives should be introduced to CADELAW and asked to vote to pass it to protect the rights of the family of the deceased. Sherry Walker Bryant is a doctoral student at Ball State University in Muncie Indiana. She is designing an educational series called “Teaching Michael Jackson” to share her research and writing a book on Jackson’s worldwide charismatic influence. Help us educate about the unjust legal loophole which may affect you when it comes to your deceased loved one or yourself once you are gone.